Superior No Trax Niru Cushion-Ease is a high performance modular male/female interlocking, anti-fatigue matting system made with a 100% Nitrile rubber compound. Providing unmatched durability and performance in harsh wet environments, the Nitrile rubber offers greater resistance to a variety of commonly found wet surfaces. A unique multi-nib support design offers exceptional fatigue relief and aeration. Large holes provide excellent drainage and aeration leaving a dry, clean work area and keeps moisture and debris away from the workers platform. 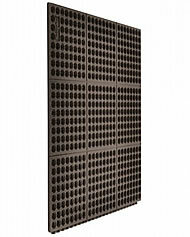 Easy to snap together modular matting system for on-site custom configurations. Now you can work standing for longer periods of time because the cushioning on this floor mat allows for proper circulation of blood throughout your body reducing muscle fatigue and back pain increasing your performance and production. This Floor Mat is not the GSI version that has a rough surface. A beveled, no trip male/female ramp systemfor floor mat edges.. Beveled and molded with mitered corners and a protruding edge tab that locks together the two adjoining ramp edges.